Acid reflux or acid indigestion is a common digestive disorder that generally occurs when the stomach acid or its content flows back into the esophagus. Usually, the LES (lower esophageal sphincter) closes as soon as the food passes through it, however if this LES is not closed properly then the acid produced in the stomach will move back up into the esophagus. It irritates the lining of esophagus which causes acid reflux. Some symptoms include burning sensation in the chest, in the upper abdomen and behind the breast bone, trouble swallowing, nausea, heartburn, bloating, etc. There are many home remedies to treat acid reflux effectively at home, but one of the most effective is to avoid the food and beverages that trigger the problem. Banana has many benefits to do with both health and beauty problems, including acid reflux. It is an alkaline fruit which helps to neutralize the acid in the stomach. Eat bananas regularly to get rid of acid reflux completely and quickly. Here are some properties of banana that help cure acid reflux or heartburn. It has rich amount of potassium that helps for better digestion and absorption of food into the stomach. Potassium is generally an alkalizing mineral which helps to reduce the overall acidity of the stomach. It contains a compound called Protease Inhibitors that helps to eliminate certain bacteria in the stomach. It helps to increase the capability of sphincter to work properly by providing the essential strength to the weak sphincter. It is a sulphur protein rich food which helps for better digestion. Banana is rich in fiber which acts as anti – acid reflux as it eliminates the harmful toxins. Banana has a chemical that helps to produce more of this mucus to stimulate the stomach lining for more protection of stomach from acids. It also has excellent source of minerals, vitamins (B6) and fiber that helps to strengthen the esophagus. It contains several components that help to suppress the acid secretion in the stomach and maintains proper pH level in the stomach. Here are some effective ways to treat acid reflux slowly and completely. Eat banana before or after meals. Or Add banana to your cereal in every morning, yogurt, smoothies and salads. Or Eat low fat banana bread, banana muffins, banana sandwich with cinnamon, fruit bowl (exclude citrus fruits), banana cake, etc. Peel a ripe banana and cut into slices. Sprinkle some sugar and pinch of cinnamon powder to it. Eat these banana pieces for better digestion regularly. Oatmeal is a great home remedy for acid reflux as it is a whole grain food that neutralizes the stomach’s acidity, reduces the pain and other acid reflux or heartburn symptoms. This combinational process is one of the best ways to treat acid reflux or GERD. Add them to cooked oatmeal and stir. Eat as a breakfast daily to cure acid reflux and constipation. Blend all ingredients on a high speed in a blender for 3 minutes. Drink this smoothie at least twice a week. Blend all the ingredients together on a high speed for few minutes until it becomes smooth. Have this smoothie (by adding ice, as per your requirement) regularly. Banana when combined with milk exhibits best antacid properties that helps to reduce the acid secretion in the stomach. Place banana pieces in a blender. Add sufficient amount of milk or soy milk. Blend at a high speed and then add a little honey. Or you can also top up this milk shake with few small chopped banana pieces. 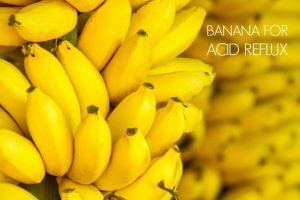 Can Bananas cause Acid Reflux? Eating unripe banana causes acid reflux because potassium in it turns into potassium nitrate which leads to acid reflux. It contains a type of indigestible carbohydrate that will promote the gut fermentation that in turn leads to acid reflux. Over ripen banana becomes more acidic and causes heartburn. It is always advisable to eat fresh banana which is neither unripe nor over ripe. Eat 3 bananas when you have acid reflux to know whether it is increasing the problem or curing. Follow these tips when using Banana for Acid Reflux treatment. If you’re suffering from fructose intolerance which is a form of sugar that resists proper digestion, then consult your doctor before using this banana more in diet. Bananas contain a lot of insoluble fiber, so if you eat them a lot, it causes abdominal pain, gas and bloating. It has proteins which are similar to latex that causes allergies in some people. So, consult your doctor before using these treatments. Make sure to get an appointment with your gastroenterologist if anything goes wrong. Do you know any other banana methods for treating acid reflux or GERD or which worked for you? Then don’t forget to share your experience with us. I have very serious problem of acidity since last 10 years, I have also done 2 times endoscopy in that mild antral gastritis is found I take medicine on that but any effectiveness is not found, tell mi any suggestions on to reduce acidity? now days I am eating banana every morning will it help to reduce acidity? Yes, eating banana can help you get relief from antral gastritis. People are led to believe that acid reflux disease is caused by high acid levels in the stomach. Think about it… Take some fruits and vegetables, some chunks of steak and put it all in a clear plastic baggy and seal it up, set it to the side and watch what the bag does. Now open up the bag just slightly and the pressure comes out. Think of the bag as your stomach and the knot you tied In the bag as your lower esophageal sphincter. Now, for the lower esophageal sphincter to close properly the stomach acid must be a certian PH. More acidic = closed and less acidic = not closed. Just because it’s “less acidic” does not mean it will not burn your throat!!! Still don’t believe??? Google: Hypochlorhidria and learn so you can teach your genius medical dr while saving your life. Look up leptin, pepsin which needs stomach acid at a certian PH in order for everything to work. then ask if your acid PH is low? then how much lower are the Tums and those PPIs making things. It’s like a fermenting bag of jungle juice sitting in those tummies. Heart burn is a symptom and not a disease!!! I just had heartburn and I was reading this site and seen bananas and I went to the kitchen to eat one and believe me it stopped my heartburn thank you!!! I did the same and it stopped…. thanks a lot! Drink fennel and ginger root tea. Before and after meal. It will eliminate the gas and bloating and decrease the post nasal drain. I tried this the past two Rey’s. Amazing! Also do Heather Tummy care with fennel tea bags. I will pray for every person in the world with this condition. Drink warm water which cleanses esophagus and digestive lining also. God Bless you. I have a sever acidity problem for number of years. 1) Take Carrot juice (70% carrots) with raw greens like Cucumber, Romaine lettuce, Celery sticks, spinach morning & evening. 2) Eat Dandelion raw or cooked. 3) Stay away from Oily & Fatty foods, meats (specially red meat), spices & chili, Include lots of fiber in your food like Steel Cut Oat meal, Chick Peas (not canned, boil your own), Red Beans, Take 1 t0 2 spoons of Physilium in water before bed. few times a wk. All the above is good for reducing the acidity & getting rid of Constipation. Thanks A lot for the informations I believe it really helps. You just enlightened my confusions over the years of therepy about the same case of Gerd and ulcers. As young as 26 i suffered this problem for 8years so it is so depressing. For past month my chiropractor has been massaging the area below my sternum and having me breathe in deep he presses in that area and then I exhale. He said do this also at home. Drink fennel and ginger root tea. They contain properties that begin to balance stomach acid thereby healing the reflux. God Bless you! I’m suffering from chest bones due to Acid reflux since yesterday. I discovered acid reflux 2012;endoscopy has been done then there was also a wound in the mouth of duodenum due to acidity. What can I do now this is very painful? As per your description, you have a wound in the mouth of duodenum. So we recommend consulting a doctor for it. Once the wound is gone completely, you can try any method mentioned above in the article to resolve the acid reflux problem. I have really bad acid relflex. and I feel very bad throat burning , i have ulcer problem . medication is really not working at all. any urgent suggestion for me? I am really in very bad condition and I am dieing. I hope this helps people. But consult your doctor too. Thanks a lot it really helps. Eating 1 – 2 bananas should be enough. I have an ulcer and gastritis. I have tried the pPPI method but seems not giving me any healing and on top of that I started having acid reflux. I decided to turn to natural remedy using juicing celery sticks, kale, cucumber and spinach. Also I found that banana helps me a lot to reduce the symptom. I have few questions. How much banana would I have to eat in a day? When should I best eat? Is there an overdose effect of eating bananas? You can eat 2 – 3 bananas in a day. It is best to eat banana after a meal. Overdose of banana can lead to headaches, Hyperkalemia, sleepiness and lack of protein. Hello I’m suffering from gas, indigestion and acidity with sour belching, bloating,severe stomach and throat burning and heartburn since may 2017. I have done endoscopy and it reported as reflux oesophagitis(grade-I) and indicating dyspepsia. Also my LES is incompetent reported there. Please help me I just can’t tolerate any more. Eat banana every day after your meals. Or else try any other method mentioned in the above article for relief. Apart from that reduce spice in your foods. I did endoscopy twice & it says mild antral gastritis. I hd severe gastritis, heartburn, nausea 7-8 yrs back and i was alright. But tis few weeks that same problem recur. My doc says its GERD. I take antacids, different medicines for GERD but not feeling better. I hv been eating bananas daily for the last 2-3 yrs bt i dnt see any difference in my condition. I need suggestions. Is banana flower good for GERD? My doctor told me that bananas was the cause for my acid reflux.Is that true? I too have suffered bloating stomach wind and heartburn for several years and spent a fortune on indigestion tablets. Read about Bananas so thought give it a try. Amazing no indigestion for 4 days now can’t believe it, I am eating two Bananas a day let’s hope it continues! !! I have one with my Breakfast and one after lunch, I eat them very slowly and chew them well. So pleased with the results. If iwill cooked and eat riped banana is it good for acid reflux or bad? Has anyone tried mastic gum? I’ve only recently started having terrible GERD-like symptoms. For the last two months, I’ve had constant feeling of fullness-whether I’ve eaten or not, belching, stomach churning, stomach cramping, and overall feelings of heaviness. I was put on Prilosec and zantac, but did not experience much relief at all. I’ve tried ginger tea, turmeric tea, licorice root tea , and eating bananas. Nothing really made a noticeable difference (to be fair the licorice root actually helped, but its not advised for long-term use). Finally, someone suggested I look into mastic gum. I’ve only been taking it now for one week, but I’ve already noticed a marked improvement. I know it’s still early, so I wanted to see if anyone else here has tried it and to what effect.